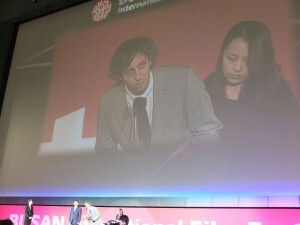 Tonight Director Maximilian Hult received the Busan Bank Award / The Audience Choice at the closing ceremony in the grand outdoor cinema in Busan Cinema Center. 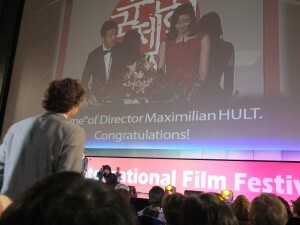 The price is 20 000 USD and is shared between the Director and the Distributor that takes on the distribution in South Korea. http://www.movieboosters.com/wp-content/uploads/2013/10/DSCF6597-300x225.jpg 225 300 Movieboosters http://www.movieboosters.com/wp-content/uploads/2013/06/logo_top3.png Movieboosters2013-10-12 20:46:002015-08-11 21:04:50HEMMA wins Busan Bank Award, the Audience Choice as Best film. 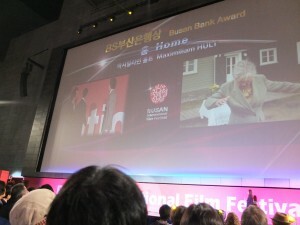 Maximilian Hult’s first feature film HEMMA (HOME) has been Officially selected for Competition in the Flash Forward section at the 18th BUSAN International Film Festival (BIFF), which takes place on October 3rd through 12th, 2013. Flash Forward is a section for new narrative features from non-Asian filmmakers reflecting audacious creativities with clear senses of cinema as an art form. The film is produced by LittleBig Productions in co-operation with Movieboosters, Filmmakers Stockholm and Spellbound Productions, Iceland with support from The Icelandic Film Centre and The Ministry of Industries and Innovations.